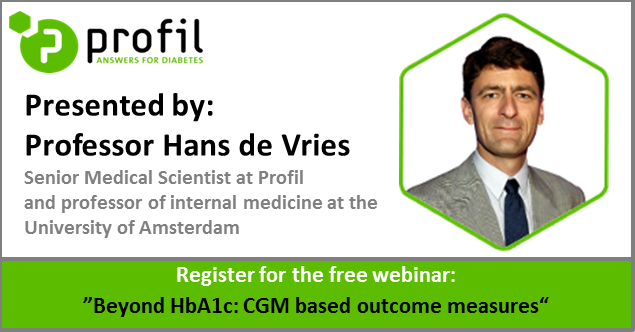 "Beyond HbA1c: CGM based outcome measures in clinical trials"
Insights from the renowned scientist Prof. Hans de Vries. Introduced in 2000, Continuous Glucose Monitoring is coming of age. The recent draft guideline on clinical investigation of medicinal products in the treatment or prevention of diabetes mellitus, released by the European Medicines Agency mentions ‘continuous glucose monitoring’ seven times, but which outcomes measures should be selected, and how should they be defined exactly? These questions will be discussed in the upcoming webinar by professor Hans de Vries. Prof. de Vries obtained board licenses in Internal Medicine and Endocrinology at the VU University Medical Centre, Amsterdam. He was appointed as professor of Internal Medicine at the University of Amsterdam's Faculty of Medicine in 2016. Having joined Profil as of 2017, he maintains his academic position for one day per week. Dr. de Vries has been Principal Investigator in numerous clinical trials and has published more than 200 peer-reviewed scientific publications. He is a frequently invited speaker at international diabetes meetings, an editorial board member of Diabetes Care, the Journal of Diabetes Science and Technology, and International Associate Editor of Diabetes Technology & Therapeutics. Dr. de Vries has been scientific coordinator of AP@home and PCDIAB, EU-funded consortia focused on closed loop system, in which also Profil was involved.